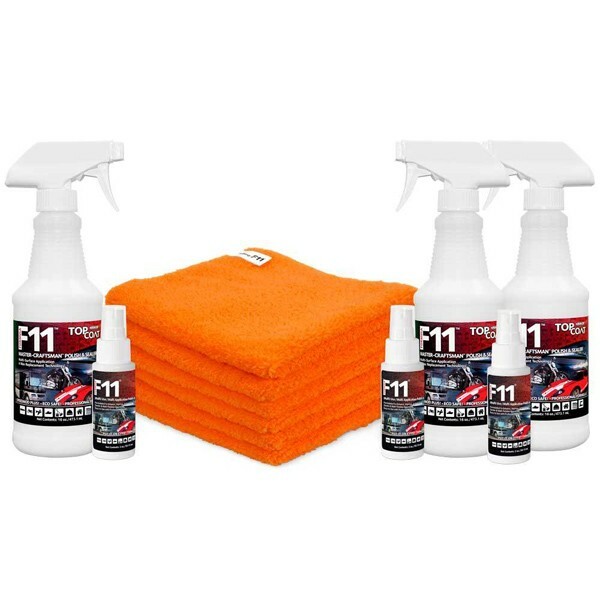 What if you never had to wash your car, truck, or motorcycle again? What if you never had to wax again? What if you never had to scrub your wheels again? Well, thanks to new technology this is all possible. Guess what this picture's of? It looks like the Grand Canyon, right? Well, it actually is a highly magnified image from an electron microscope. It's magnified thousands of times. It's a crack in the surface of steel. This is something you can't see with the naked eye, or feel it with your hands, but it's there. All surfaces have these imperfections, we just can't see them. The challenge with this is when it comes to cleaning a surface, dirt, and grime, and oil, and grease, and that sort of stuff, finds its way into these crevices. It holds onto it, and anchors onto it, and it's hard to clean a surface because of that. We end up having to use harsh soaps and things that actually damage the surface over time, because we're attempting to dissolve the dirt and get rid of it. If you look at this picture, this is a cross section of auto paint. It's magnified 500 times. What you're seeing right here, this is the metal. If you've ever seen a car fender before it's painted, it has all the swirl marks on it where the machine sanded it and prepped it with a smooth surface to be ready to be prepped, to prime and paint. That's what these little things are. This is the swirl. That's how magnified that is. This here is your primer and paint coats, and this layer here is your clear coat. Now if you notice it has all this jagged little valleys and all that. This isn't as greatly magnified as the previous picture of the steel. If we were, it would look like the Grand Canyon. Let's say this is a zoomed in image of a surface. "Well, what happens when you spray TopCoat on and rub it in, it fills in all these microscopic valleys and stuff. Because what TopCoat's made of is a bunch of microscopic particles that Scott has developed a formula for. It'll fit in all these areas where other traditional waxes and other sealants will not. They won't do it. " TopCoat really gets in there, and it forms this protective barrier. What happens is when dirt comes along, the dirt can't make it to the surface. It rests on the TopCoat and it will not stick or adhere to the TopCoat. It's just sitting there. But over time if you don't reapply TopCoat, of course it'll wear down from weather over several months, and the dirt will get to the surface. But what you do, instead of trying to do like most people and use water and soap to try to dissolve this dirt and get rid of it, which will harm your finish overtime, instead of that, you just apply more TopCoat. TopCoat's microscopic, which will get under that dirt and lift it off that surface, and it'll start floating on top of the TopCoat. The TopCoat will dry clear, and you can't see it, but it enables you just to wipe the dirt away. Another amazing thing about TopCoat is it will bond to itself. Over time as you apply it, every month, or every 90 days, or however often use it, it'll just keep building up a layer on top of itself. It's clear you can't see it, but you literally get the surface in a condition. Eventually it becomes, over several months, where you never have to use water, soap or anything. Anything that gets on it, you just wipe it off. It sounds crazy, but it's true. Here's some pictures of it. You can look at vehicles that were treated with it. TopCoat can be applied to anything, whether it's plastic, or glass like a windshield, or windows, or like this A pillar the paint on it, or rubber, anything. TopCoat will go on anything and protect it. You can notice the water beading up, the water will not attach. Soon as this car moves, all this water just rolls off. It's amazing to watch. Let me show you some other pictures, these are zoomed in. You can see the water beading up because it's not attaching. It will not adhere. TopCoat replaces all of this stuff. There is no need to buy outdated, old technology, in this day and time and put it on an expensive vehicle, or any bike, or anything you have of value. You don't want to spend all these thousands of dollars buying all this stuff. This is all marketed stuff that is outdated old technology, all this. You don't need any of it. It's crazy to use that in this day and time. It's equivalent to using a horse and buggy in this day and time to travel when you could just get in a jet and do it right. 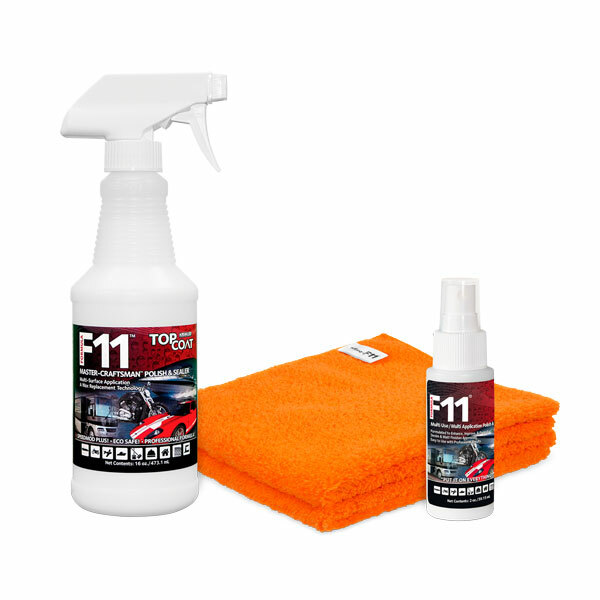 All you need is this right here, F11 TopCoat. F11 stands for Formula 11. The original TopCoat was groundbreaking technology. The new Formula 11 takes it even further. What we're doing ... TopCoat's been around a little while, we've developed it over the years. 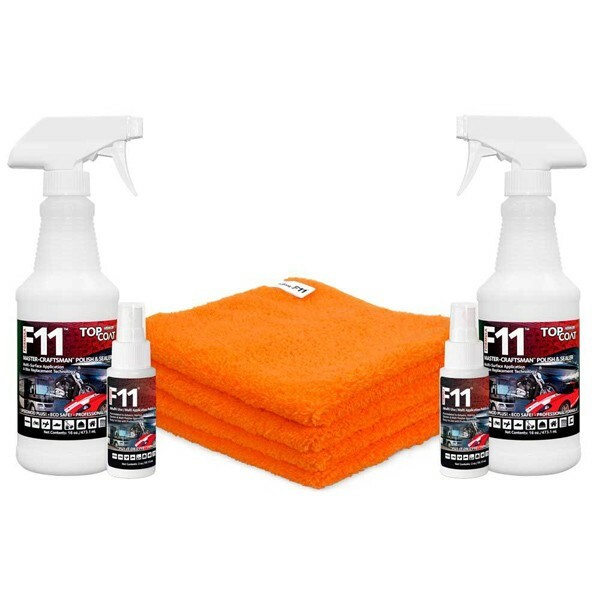 Even more recently, we've even had better technology with this F11 Formula that we developed. We have a lot of industrial clients, a lot of high end car dealerships. I know some Harley dealerships use it exclusively. But, we want to make it available to the public. We've never done that on a large scale like we're doing now. We're doing this special web offer. TopCoat, normally for a 16 ounce bottle is about $59 bucks, about $60 bucks for a 16 ounce bottle, which is an awesome deal considering what all it replaces. It literally replaces thousands of dollars of products that you never buy anymore. You never need waxes anymore. You never need leather conditioners, or chrome polishes, or car washes, or any kind of wash stuff. You don't need any of that junk. All you need is TopCoat and a bunch of microfiber towels, and you're done. What we did is we put together a package that normally would run $83.20. Instead of charging for all that, we're just going to give these new high quality microfibers, two of them to you, along with a travel size full version. It's filled with TopCoat, of F11 travel size bottle, where you can throw it in your glove box, or you can put it in your saddlebags on your bike, and travel with it. If you need it, you can spritz the little bottle, and have your microfiber there with it in the glove box, and you're good to go. We put all this together and we're still going to just charge the $59.97 for the regular 16 ounce of TopCoat, but we're going to give you the two microfibers and the travel size free.